a) by seeing what the Bible says, and by asking someone else what they think. b) by seeing what the Bible says, and by listening to our conscience. a) wait until you go to church and talk to your Sunday School teacher. b) confess it to God at once. a) becomes very angry with us. b) forgives us and makes us clean again. b) it is all right to do it if your friends are doing it. a) God will overlook his sins because He is so kind. b) God will chasten (reprove) him. 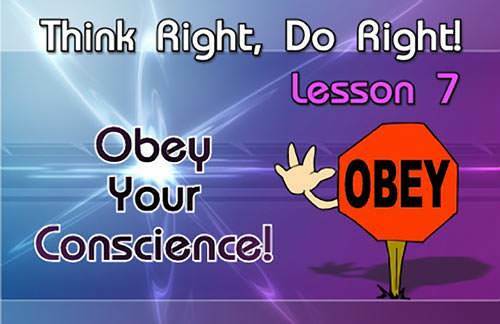 a) do not disobey your conscience. b) blame God if you have trouble in life. a) we should stop doing those things. b) we can keep on sinning as long as we just ask God to forgive us. a) do it so they will like you. a) try it once to see what it is like. a) is one of the worst sins that young people can be involved in. b) is not really wrong since so many young people are doing it. Congratulations on completing this Course! We hope you can now go on to "The Boy and the Cabin" or perhaps one of the "Know Your Bible" courses in "Bible Exploration".